Team17 has released an explosive new trailer to celebrate Worms W.M.D’s launch today. ·Extensive single player campaign including 20 training missions, 30 campaign missions and 10 challenges to complete and compete against your friends on the leaderboards with! ·Local and online multiplayer for up to six players with up to eight worms each! ·NEW Vehicles: Worm warfare gets serious with the introduction of vehicles for the first time in the series. Dominate the landscape in warfare-ready tanks, take to the skies to unleash hell from above in helicopters and navigate the landscape in the mech. ·NEW Buildings: Buildings are a fantastic new addition which offer a great tactical advantage to the classic Worms gameplay. Players can now enter buildings amongst the landscape and fire off shots from inside, but when the turn passes, their worm will be hidden inside. ·NEW Crafting: Weapons and utilities can be crafted during the player’s turn or even in between turns during online play, as the opposing teams take their turns. Crafting really expands the weapon set and adds in many brand new fun weapons including the Party Balloon, Luzi, Electric Sheep, Sticky Grenade and Concrete Angry Donkey to name but a few. Players will start the game with a specific amount of crafting ingredients, depending on which game scheme is chosen. Or none at all if they choose the Classic scheme! Further ingredients can then be collected from crafting crates or scavenged by dismantling existing weapons. Can’t reach the enemy worm and you’ve only got a Baseball Bat? Dismantle it and craft a grenade! ·New and classic weapons: Over 80 weapons and utilities at your fingertips, including many returning classics and a slew of new additions such as the Dodgy Phone Battery, the Unwanted Present and the OMG Strike. ·Mounted Guns: As if over 80 weapons and utilities wasn’t already enough! A range of different gun types are placed around the landscape, allowing your warmongering worms to do even MORE damage! 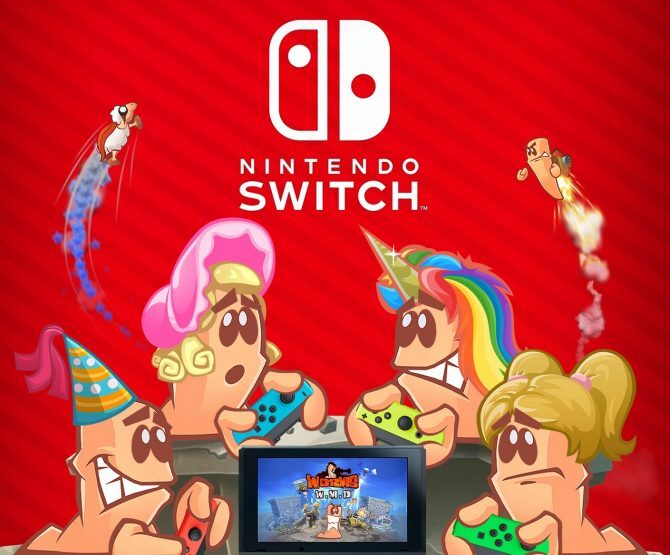 ·Classic Worms physics and gameplay: Our brand new engine recreates the feel of the fan-favorite entrants in the series; and sees the reintroduction of the much loved Classic Ninja Rope! ·Wonderfully 2D: The best implementation of the Worms formula yet, now with a brand new worm, and gorgeous digitally-painted 2D artwork. ·Customization! Customize your worm names, team names and look with a multitude of different fanfares, gravestones, hats, speechbanks and victory dances to choose from! You can watch the trailer below. 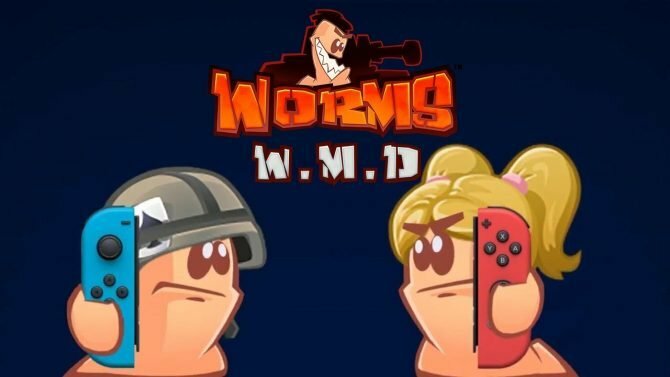 Worms W.M.D is now available for PC, PS4, and Xbox One. 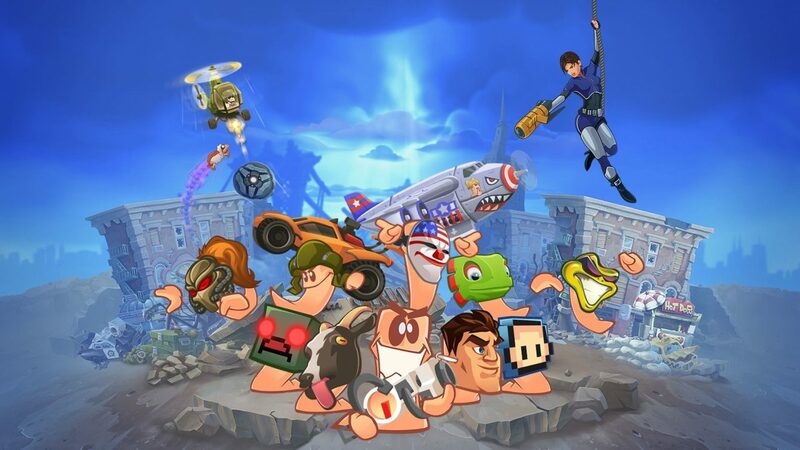 British developer Team17 has announced that the physical copy of Worms W.M.D. for the Nintendo Switch has been canceled, according to its official Twitter.